One way to read the inversion in eurodollar futures is that the market expects the Federal Reserve to ignore growing economic and financial concerns. There is a very reasonable basis for this structure given recent history. Central bankers and Economists have shown a remarkable, and remarkably consistent, ability to talk themselves out of any negative indications. This is the idea behind "transitory." We see it, but we ignore it anyway because of reasons. The whole point of econometrics and Positive Economics was so that it would never be this way. There was great interest in turning economics from more so an art form dependent upon subjective interpretations into a science where mathematically-determined evidence would remove a great deal of opinion-based noise. They would even seek a statistical basis for what may be properly defined as evidence. If it regresses, it counts. There are innumerable instances, however, where common sense would have made all the difference. No matter how many elegant equations, sometimes something so obvious falls right into the realm of the mathematically-free self-evident. Eurodollar futures and the curve inversion of 2006 and 2007 are prominent examples of this form of "data dependence." The housing bubble that precipitated it also qualifies. Bubbles are fuzzy only in that everyone knows what they are yet it isn't "proven" until they pop. In that gray area before the end rationalizations abound; this is the key ingredient that makes a bubble in the first place, the fuel to keep it going beyond all rationality. It infects even these practitioners of Positive Economics. Ben Bernanke's tragic history of quotations doesn't begin with "subprime is contained." Throughout the middle 2000s, he and those like him were quick with "nothing to see here." It didn't matter how much economic history became bent by the asset class distortion, these "data dependent" Economists could twist any stochastic analysis to their nonsense. Perhaps the most ominous sign in terms of economic variables was the savings rate. According to initial estimates, it was negative in 2005 and therefore very hard to ignore. Consumers, it was estimated, were spending more than they brought in via earned income. Subsequent benchmark revisions have turned the savings rate positive but kept it unusually low nonetheless. The common sense interpretation of very low or negative savings is debt, which fit anyone's view of the times. The common saying houses-as-ATMs was a pretty widespread acknowledgement of the effects or distortions of the housing bubble. Prices went up precipitously and people took advantage of it by borrowing way more than they would have, or should have, otherwise. Not so fast, many officials interrupted. There were alternate explanations for all these things including the savings rate; additional interpretations that with all the right mathematics behind them were supposedly more valid. In April 2007 (April 2007! ), two researchers from FRBNY, Jonathan McCarthy and Charles Steindel, published a paper first establishing the links between the housing market and consumer spending. This was the era of huge denial, and policymakers were desperate to show that even though the housing bubble was already well into reversal, fallout from it would be limited and quite manageable from a policy perspective. That meant, of course, addressing the deformation of the savings rate. If the mortgage tap was turned off and that was indeed responsible for low or negative savings, the implications for consumer spending at the margins and therefore the macroeconomy as a whole were not good, to put it mildly. McCarthy and Steindel's paper, among other factors of the housing bubble (also "nothing to see here"), came up with an alternate explanation. The personal saving rate was negative in 2005 according to currently available data. 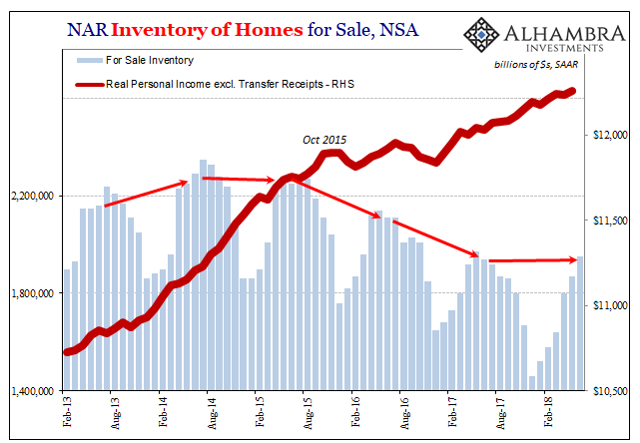 One conclusion that many have drawn is that the sharp recent increases in housing wealth have increased spending relative to income and driven down the saving rate, or in popular terms, consumers have saved through their homes. While this contention is a superficially plausible, a closer examination suggests a more complex story. Specifically, consumer spending has increased relative to personal disposable income, driving down personal saving. However, there were also very large increases in the amount of undistributed corporate profits in 2004 and 2005-the one component of private sector income not credited to household income in the national accounts and saving data. If the household income and saving data are both augmented to include undistributed profits the 2004-05 drop in the saving rate disappears (Chart A1). Therefore, the recent decline in the personal saving rate, rather than reflecting a step-up in consumption, may be in large part an artifact of a shift in private sector income away from households and toward corporate undistributed earnings. Seriously? This contortion is so nonsensical that you have to stand in awe of it. But since there is mathematics and established (though really weak) correlations, why not? Companies were (and are) paying less to labor leaving consumers to spend more proportionally out of their income which they did via debt, and this was all just coincidence, supposedly, of the times that appeared to be a bubble in housing but were just "an artifact of a shift in private sector income away from households and toward corporate undistributed earnings." History has instead shown, decisively, sometimes money-driven debt-fueled asset distortions are really debt-fueled asset distortions. The flipside has also proved equally true; take away the money growth and the debt fuel, in the aggregate, disappears, too. No more "artifact." No more consumer spending, no more economy, either. Regardless of how one may interpret the specific variables, the links between housing and economy may not be exactly known but they are intuitive all the same. If housing sector struggles it stands to reason the economy will, too. And it works both ways, as in why the housing sector may be struggling in the first place. A collapsing bubble is not the only thing to worry about. Apart from last year's hurricanes, the housing market has been struggling since at least last March, really going back to November 2016. It really started to slow down back around July 2015 for reasons that were obvious then. The economy had entered a downturn that superficially it appears to have come out of but in the labor market not so much. The primary defect according the National Association of Realtors (NAR) is a dearth of sellers. We've discussed this problem at length for a long time already, so there is no need to rehash it here. 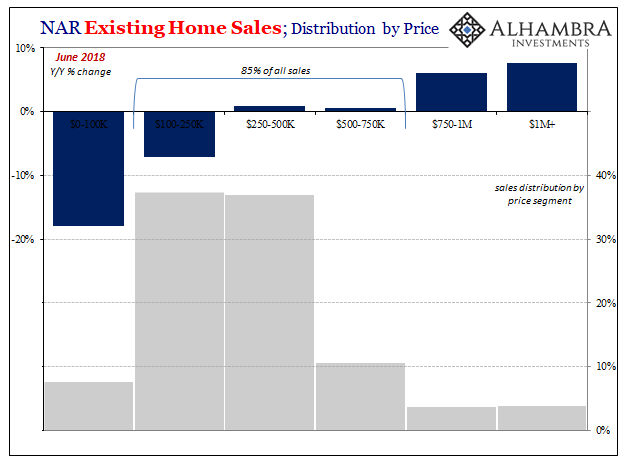 In brief, in an otherwise robust housing market if there aren't "enough" sellers to meet the demand of buyers it has to be because reluctant sellers are concerned about other things (income) than home prices. 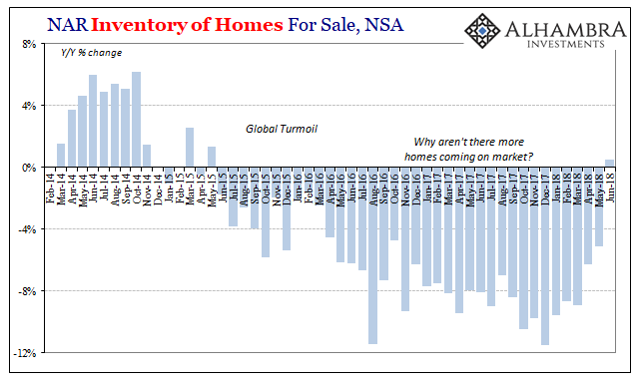 While the total volume of resales declined again in June 2018, the latest estimates from the NAR, the one positive that stands out is inventory. For the first time in three years, the number of homes available for sale increased if only slightly. Thus, it isn't really a bright spot so much as less of a uniformly negative indication for however long it shows up. Revisions next month might even flip the sign. It may be that June's figure was an aberration, an unusual positive in this one important factor, or it may be the beginning of a new and actually positive trend. Or it may be that the real problems in housing aren't just the lack of inventory alone. 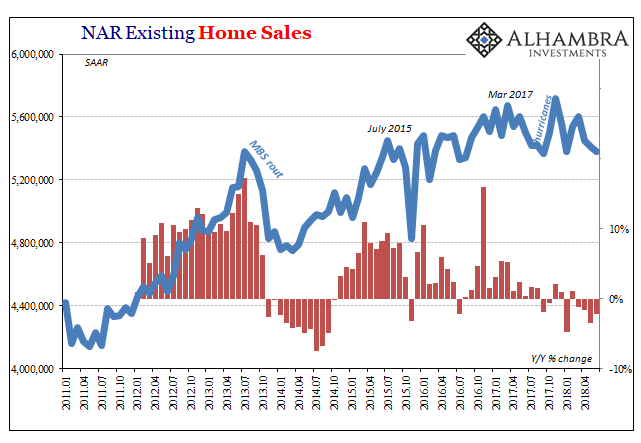 There are a lot of ways to look at 20 months (going back to November 2016) of sagging home sales. We already know which way Jerome Powell chooses to see it. And so does the eurodollar futures market.